Honda has created a rocket shaped 'space convoy' showcasing all its vehicles as it celebrates its biggest year of product launches. 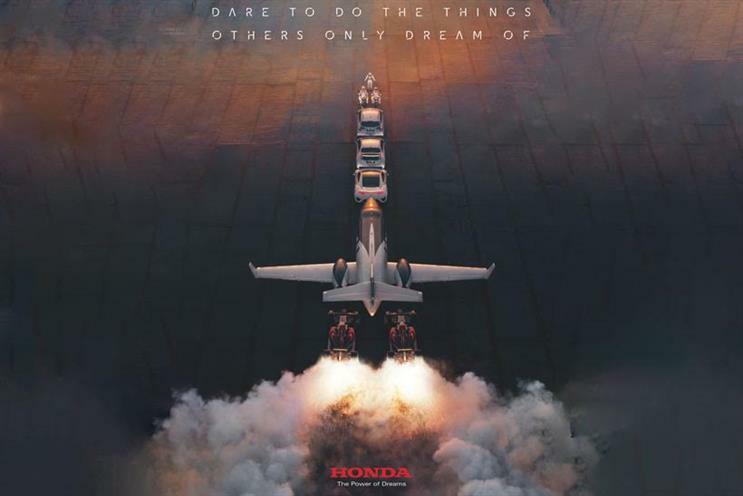 The pan-European brand campaign, which goes live tomorrow and is called Ignition, aims to dramatise Honda’s "daring ambition" with the strapline "Dare to do the things others only dream of." The spot features space travel-inspired iconography and cinematic details such as atmospheric photography set over the classical track that was etched onto the Voyager 1's Golden Record, as selected by NASA in the 1970s. Opening on Honda’s humanoid robot, ASIMO, the camera reveals a line-up of Honda products on a runway in the shape of a space shuttle. The "heritage" of the brand has been woven into the film and it also features appearances from special McLaren-Honda driver Jenson Button and the voice of the late Brazillian racing driver Ayrton Senna. Jemma Jones, marketing communications manager at Honda Europe told Marketing the campaign was about celebrating the "year of Honda". The brand will launch 6 products in 2015 - double its usual output. It has also developed a small airplane jet. "It’s about widening appeal for Honda and widening the demographic whilst celebrating the diversity of the brand and the celebrating its challenging spirit," she said. "It’s about igniting the brand and delivering a change in pace with more energy and excitement." She added 2015 is a "bit of a positioning shift" for the brand, building on the fact the brand is seen as a durable and quality brand with bold, confident and daring messaging. "With Ignition what we set out to do was to liken the engineering achievements we’ve accomplished and the unparalleled product diversity that Honda and really ignite the brand with a bang. "We’ve likened our brand diversity to the biggest feat in mankind – space exploration. It’s about making a massive, bold statement about Honda."